In a medium sized bowl combine the peanut butter, raisins, honey and powdered milk. Stir well to form a thick dough. Break off small chunks of the dough and roll each one into a small ball. Roll the balls in cocoa powder or shredded coconut or wheat germ or chopped nuts, or powdered sugar or a few in each for a variety. Place the coated balls on a plate and allow them to dry out until serving time. Store leftovers someplace cool. 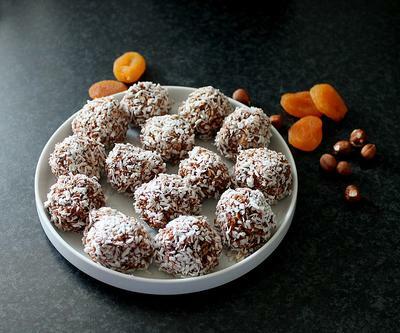 See more Truffle Ball Recipes.